A Sunday Times (London), Best Book of 2018 "A thoughtful, entertaining, and occasionally profound critical study of the texts that entertain, move and, sometimes, shape us." --The Spectator (London) "A bold, witty, and brilliantly argued analysis of the role pop culture has played in the rise of American extremism." --Ruth Reichl "You'll never look at your favorite movies and TV shows the same way again. And you shouldn't." Almost everything has been invoked to account for Trump's victory and the rise of the alt-right, from job loss to racism to demography--everything, that is, except popular culture. In The Sky Is Falling bestselling cultural journalist Peter Biskind dives headlong into two decades of popular culture--from superhero franchises such as the Dark Knight, X-Men, and the Avengers and series like The Walking Dead and Game of Thrones to thrillers like Homeland and 24--and emerges to argue that these shows are saturated with the values that are currently animating our extreme politics. Where once centrist institutions and their agents--cops and docs, soldiers and scientists, as well as educators, politicians, and "experts" of every stripe--were glorified by mainstream Hollywood, the heroes of today's movies and TV, whether far right or far left, have overthrown this quaint ideological consensus. Many of our shows dramatize extreme circumstances--an apocalypse of one sort or another--that require extreme behavior to deal with, behavior such as revenge, torture, lying, and even the vigilante violence traditionally discouraged in mainstream entertainment. "Leaves no theory unturned. . . the author is thoughtful throughout." --Jonathan Dean, Sunday Times (London), Best Books of 2018 "A thoughtful, entertaining, and occasionally profound critical study of the texts that entertain, move and, sometimes, shape us." --The Spectator (London) "The Sky Is Falling eloquently chronicles pop culture's pervasive role in mainstreaming extremism. . . . [It's] a fast-paced and eloquent ideological treatise on how radical politics has normalized extreme behaviors in films and TV shows." --Shelf Awareness "Biskind breathlessly excavates the last two decades of popular culture, hunting for clues about the rise of political extremism in America." --Publishers Weekly "[Biskind] convincingly demonstrates how movies and TV have softened--or hardened--audiences toward an embrace of the extreme, past the point where reason, pragmatism, and conventional morality hold sway. . . . Incisive analysis about 'the power of culture to inflame our emotions' and render reasonable debate inert." 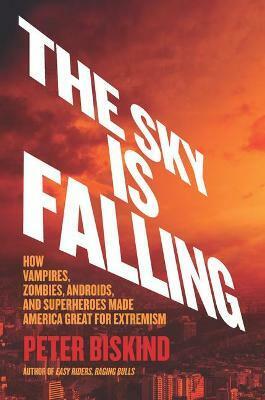 --Kirkus Reviews "The Sky Is Falling is not only insanely readable, it demonstrates how the way for Trump and all kinds of fundamentalists was paved years ago by apparently apolitical popular culture. This is a book about the seismic change at the very heart of today's society, and a book for all those who want to know exactly what a mess we're in." --Slavoj Zizek "A bold, witty, and brilliantly argued analysis of the role pop culture has played in the rise of American extremism." --Ruth Reichl "The only thing better than seeing a good movie is reading what Peter Biskind has to say about it. Who else can explicate the hidden politics of movies and make you laugh out loud at the same time?" --Barbara Ehrenreich "Peter Biskind's kaleidoscopic deep dive into the symbiotic relationship between the narratives of popular entertainment and our political culture had me talking out loud to myself. You'll never look at your favorite movies and TV shows the same way again. And you shouldn't." "Your book was . . . like a bag of pot, with me saying, 'I'm not gonna smoke.' But I was insatiable."